Manila's A-listers always look forward to the yearly Tatler Ball. It is an evening of glamor, style, elegance, gourmet food, wines, champagne, entertainment, music and dance...not necessarily in that order. During the Tatler Ball, ladies and gents are in their haute couture best and a display of the most glittering and biggest rocks on the fashionistas' ears, neck, fingers, and wrists are just dazzling! The main trust of the Tatler Ball is always Charity. It brings out the philanthropic heart of the invited guests, and indeed, the yearly Ball raises megabucks for their chosen beneficiary. This year, it was the Habitat for Humanity, housing for the poor, chaired by Fernando Zobel de Ayala. At 100,000PHP per home, Tatler sponsored 10 homes. I am sure that many of the invited guests were generous in their contribution. There was an auction of 4 items, (signed boxing gloves by Manny Pacquiao) a Parisian Experience (3 nights in a deluxe room for two at the Shangi-La Hotel, Paris), a Tuscan Adventure for two people (a 2 night stay at the Fonte de Medici inclusive of 2 business class tickets to Rome via Singapore Airlines) and lastly a Jaeger le Coultre Limited Edition Watch. The wines this year were selections from the Estampa Vineyards, Chile and the champagne was as usual, Moet et Chandon Brut Imperial. Shangri-La's team of Chefs outdid themselves and whipped up a 5 course gourmet dinner that for sure impressed the most discriminating palate. I can't say the same for everyone but my friends and I had a blast dancing. Congratulations to Irene Francisco Martel, Anton San Diego and the rest of the Tatler team for putting together a world class ball that we all enjoy yearly! Anne Curtis is sweet with no star complex about her. She glowed in this Rajo lace gown. We had fun in our table with david Lim, Tess S. and Manny S.
Old world chic- I just love Ricky Toledo's velvet shoes and Chito Vijandre's leather! Miss Sunshine, stunning Rossana Prieto! 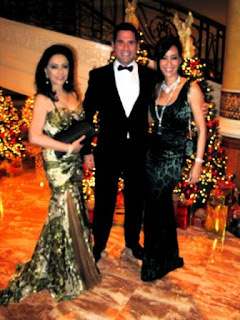 Elegant in one shoulder Ralph Lauren, Tina Jacinto with daughter Jackie, in a vintage ensemble from New York. In the spirit of Christmas, Green stands for hope. Hope for a better future for our marginalized population. Tatler blesses them with housing thru Habitat for Humanity. Tess Schoefer in panther green,Tina ocampo in emerald green, and myself in forest green.